Inevitably, much of D10 has been a reflection on the legacy of Steve Jobs, the iconic Apple founder who died last year. 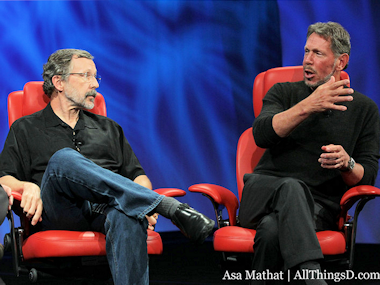 However, the conversation moved from the background to the foreground on Wednesday afternoon as two of Jobs’s longtime friends — Ed Catmull and Larry Ellison — shared their reflections with Walt Mossberg. Naturally, there was lots of talk about Jobs’s charisma, legendary negotiating skills and vision. But Catmull noted that not all of these qualities were there in Jobs’s early days, something that Ellison agreed cost him his job at the helm of Apple. “The way he negotiated, the way he interacted with people, didn’t initially work well,” Catmull said. However, Catmull said that Jobs was smart enough to see this and learn from it. Among the fascinating stories was the tale of how Jobs and Ellison got to know one another as neighbors more than 20 years ago. Jobs’s girlfriend had given him a live peacock as a birthday present and Ellison went over to Jobs’s house to complain about the noisy bird, noting he was a programmer and didn’t like to be awakened early. “You don’t like that bird either?” Jobs asked Ellison. Jobs said he would tell the girlfriend that he had to get rid of the bird, but only if Ellison backed him up. As for Pixar, Catmull noted that Jobs had a different presence. Jobs’s key characteristic, Ellison said, was struggling through every detail, obsessing about it until it was fixed to his satisfaction. Apple came to be the most valuable company in the world, but that wasn’t even one of Jobs’s goals, Ellison said. But, Ellison said, Jobs did call his friend when Apple passed Oracle in market capitalization, noting that a lot of folks in Silicon Valley measure themselves by their company’s value. And, Ellison said, the crazy thing was Apple kept going up and up. So much so that Ellison called Jobs to tell him to knock it off and that he was making everyone else look bad. As for Jobs’s signature outfit of a black mock turtleneck and jeans, Ellison said it wasn’t a fashion statement as much as it was Jobs not wanting to have to invest time and energy thinking about what to wear. It wasn’t all sunshine, though, as Ellison reflected on how exasperating his best friend could be. “He was a bit of a control freak,” Ellison said. Ellison noted that he grew so tired of seeing Jobs show him a slightly updated version of “Toy Story” ahead of the film’s release that he would only visit if Jobs promised not to show the movie again. The Oracle chief said that he also grew tired of spending Sundays walking through a mock-up of the Apple Store talking about the checkout process and bemoaning the flaws in the Oracle software. But Jobs could be brutal to his workers as well. “He learned to temper that,” Ellison said. There was also consensus from the panelists that there really is no way to imitate Jobs just by looking at his management style. As Ellison put it, it’s like trying to paint like Picasso by wondering if you need more red. The talk began with a video highlighting some of Jobs’s many appearances at the D conference over the years. 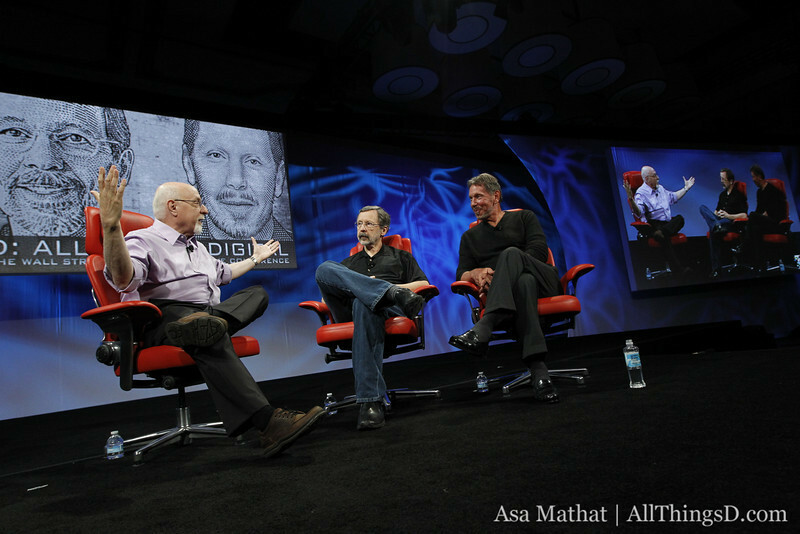 Jobs appeared on the D stage six times before he passed away last October, including a memorable joint panel in 2007 with Microsoft Chairman Bill Gates.